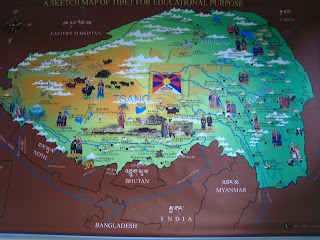 (¯`'•.¸Around the World : Cultures and Tales¸.•'´¯): SAVE TIBET ! Tibet is commonly known as the "Roof of the World." More than two thirds the size of India, it stretches for about 2,500 kilometers from west to east. At present there are about six million Tibetans throughout the world. Since 1960, many Tibetan exiles have settled in Dharamsala, the capital of the Tibetan government in exile led by Tenzin Gyatso, the 14th and current Dalai Lama. He was born on April 1989. May 14, 1995, his Holiness the Dalai Lama officially proclaimed him as the reincarnation of the 10th Panchen Lama. May 17, 1995, he and his parents disappeared from their home after being taken into Chinese custody. May 28, 1996, China admitted to have the custody of the young boy and his parents. He is deprived of his religious education and traditional upbringing essential at this age. His safety and future remain a major concern. He is considered as the world’s youngest political prisoner. China fails to publicly declare the boy’s whereabouts despite international appeals. The world’s youngest political prisoner at age 6 is now 19 years old and still missing. 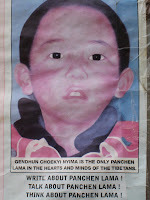 The search for the Panchen Lama will not stop. 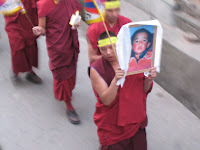 Global concern and campaigns are critical for the the Panchen Lama’s freedom. TWA appeals to individuals organization, government officials who believe in truth and freedom to join the Tibetans in their search. From the regional Tibetan Women’s Association Tipa Road, McLeod Ganj. 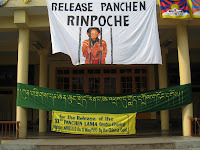 On every Friday of each week until his release a yellow ribbon will be tied to the tree in the monastery and Tibetans will march in McLeod Ganj. China’efforts to control Tibet entailed mass-scale physical destruction combined with policies aimed at erasing Tibetan culture, religion and ultimately its identity. The exploitation of Tibet’s natural resources, massive deforestation and unchecked hunting severely damaged Tibet’s fragile ecosystem. Parts of Tibet are used as nuclear test sites and dumping grounds for nuclear waste. 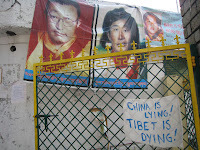 Human rights violations by China in Tibet began with the occupation and continue to date. “On 22 November 1989 I participated in a peaceful demonstration in Lhasa with five other nuns from my nunnery. We were immediately arrested and taken to a detention center. I was interrogated for two months. We were hung from the ceiling, cigarettes were stubbed on our bodies, and we were beaten severely with metal wires. Some female prisoners had electric batons inserted in their private parts. I was then sentenced to seven years’ imprisonment and moved to Drapchi Prison. Conditions there were hard – there was never enough food nor other basic necessities and all the prisoners were made to work. We were not allowed to practice any of our religious duties. Nevertheless, we secretly made rosaries out of bread and prayed together. We staged protests against our guards and some of us even recorded a cassette of freedom songs, which was smuggled out of prison. The punishments for those caught carrying out these activities were severe. Curator: Rinzin Choenyi, nun, formerly of Shungseb Nunnery, Tibet. Since 1959, about 100,000 Tibetans fled to neighboring countries. Many died on the way as a result of Chinese attacks and harsh conditions. 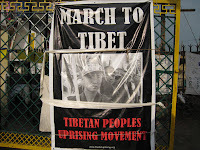 Thousands continue to escape oppression and persecution in Tibet each year. “In the winter of 1993, a Chinese ‘re-education’ team came to our monastery. I refused to obey their orders to denounce His Holiness the 14th Dalai Lama and realized I had no choice but to leave. I decided to escape to India. A few weeks later I started my journey with three other Tibetans. We walked through high mountain passes where we hoped to avoid Chinese army patrols. As we moved higher we were caught in heavy snowstorms and lost our way. Our blankets got carried away in the storm and we all suffered frostbite but had no choice but to continue walking. After three days we reached an encampment of Tibetan nomads in Sikkim. We were totally exhausted and suffered extreme pain from our frostbite. The nomads took us to an Indian army post for medical treatment. I was more worried about being reported back to the Chinese than about my health. We were hospitalized in Gangtok but my condition did not improve. After six months my legs and some of my fingers were amputated. Two of us were finally allowed to go to Dharamsala, India, but the other two, whose physical condition was better, were sent back to Tibet. From the Tibetan museum, Dharamsala.